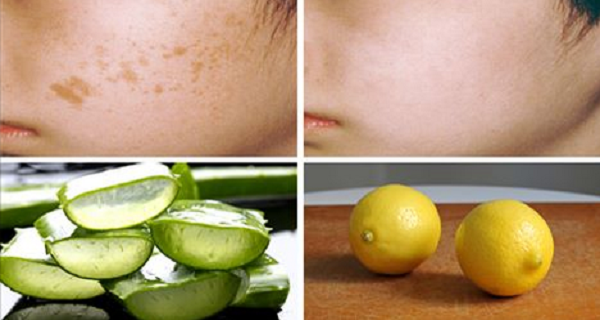 Dark spots are a common skin problem which many people face. Skin discoloration usually occurs due to frequent sun exposure and it might appear on the face, neck, chest, hands, shoulders or back. Brown spots generally appear as a result of aging, genetics or sun exposure. Fortunately, you don`t have to undergo laser or chemical treatments in order to get rid of these spots because there are natural home remedies which are equally effective as the previously mentioned chemical treatments. The natural acidity of lemons is very useful in bleaching and lightening of the dark skin spots. Squeeze one lemon, soak a cotton ball in the juice and apply it on the affected area. Repeat the procedure two times a day. It is recommended that you use only freshly squeezed lemon juice. This plant has powerful regenerative properties which help you eliminate the dark spots from your skin, particularly those caused by sun exposure. Sandalwood has strong antiseptic and anti-aging properties which are very effective in the treatment of hyperpigmentation and brown spots. You can make your own sandalwood pack by combining two tablespoons of sandalwood powder, two teaspoons of rose water, and one teaspoon of glycerin and one tablespoon of lemon juice. Apply the packs on the affected area and let them air-dry. Rinse it with cold water. Repeat the procedure several times a week, until your brown spots completely disappear. Also, you can combine two tablespoons of sandalwood powder, one tablespoon of orange juice, one teaspoon of lemon juice and the contents of two vitamin E capsules. Apply this mixture on your face and allow it to act for half an hour. Then wash it off. Repeat the treatment a couple of times in a week, until you notice visible results. Another alternative is to mix a few drops of sandalwood oil with one tablespoon of olive oil or almond oil and massage your face with the mixture. Do the treatment before going to sleep and let it act overnight. Another effective remedy for naturally removing the black spots is by making a mixture of horseradish, apple cider vinegar and raw honey. Squeeze lemon juice and soak a cotton ball in it. Use this as a toner. Then, apply the horseradish mixture to the hyperpigmented skin and let it act for about 20 minutes. Finally, wash your face and apply an SPF cream before going outside, because the previous treatment makes your skin sensitive to UV rays. Red onion acts as a natural acidic agent which can be used in the treatment of dark spots on the face. The procedure is very simple. Cut the onion and juice or blend it. Dip a cotton swab in the resulting juice and apply directly on the affected area. Let it act for 10-15 minutes and then wash with warm water. Regardless of the treatment you will choose, it is very important to do it regularly until you obtain the desired results.